This set of three smaller high quality round red walnut finish plate frames will securely hold and protect plates. The deep red brown finish with inner gold striping complements any plate and lends a rich and elegant look. Available for 6-1/2" to 7-1/4" plates. 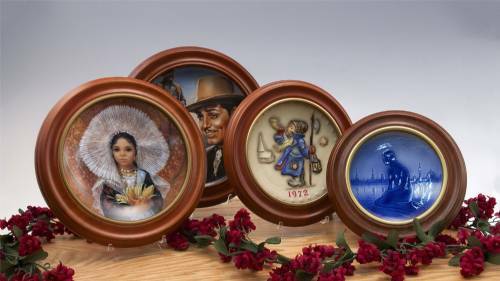 For the Hummel collectible plates size 7-1/2", please use the next size up, click here.